Blizzard’s new MOBA Heroes of the Storm is a work of Smash Bros.-style fan fiction that mashes together characters from all the developer’s different universes. Or more accurately: it adapts them. The most noticeable change they made to the iconic StarCraft Terran unit, the medic, is her voice, of all things. Blizzard injected Morales (pun intended) with a lot of StarCraft fan service-y details, as they’ve done with pretty much every character in HOTS so far. One of her two heroic abilities, for instance, summons a Medivac to transport Morales and her teammates around the map. It can even heal them the same way the original Terran flying unit from StarCraft does. Longtime StarCraft fans will notice some major differences between Morales and her RTS counterpart, though. There are some obvious ones. A MOBA is a different beast than a game like StarCraft, so she’s been fleshed out with more in-game abilities than she originally had. She also looks different. That’s partly the simple result of HOTS being a slicker, more modern game than StarCraft. But it’s in Morales’ aesthetic that Blizzard’s thematic departure from the StarCraft medic starts to shine. 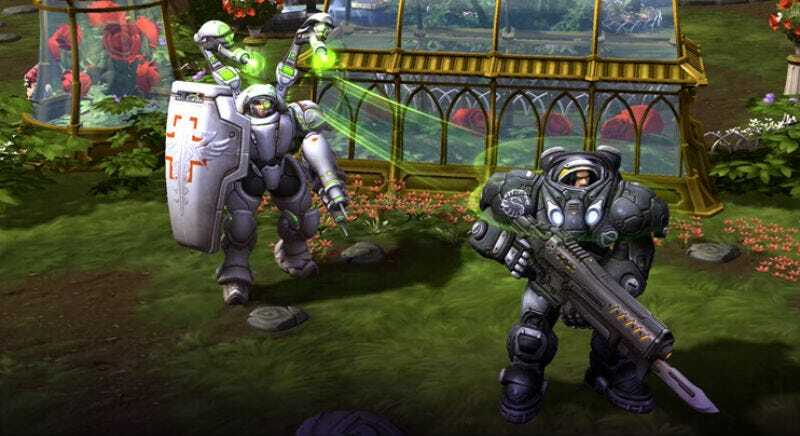 The medic was first introduced to StarCraft with its legendary 1998 expansion pack Brood War. She was a support unit who could heal allies in her immediate vicinity. Her in-game experience was chunky and pixellated. Remember: this is a game that came out in the nineties. Blizzard games pioneered the fan-favorite tradition of giving RTS characters silly and often fourth-wall breaking dialogue. All you had to do to get a character to start talking was click on them over and over again until they started to deviate from their standard combat barks. The medic’s lines were very sexually suggestive. She’d say something like: “State the nature of your medical emergency” in a chipper tone at first. That would quickly give way to a deep-throated, lusty voice asking coyly, “Where does it hurt?” Or: “Ready for your spongebath?” Or maybe: “I’ve already checked you out commander, you want another physical? Instead of teasing the player with offers of sponge baths, Morales earnestly explains her intentions for joining the armed forces, saying: “I joined the UED because I wanted to make the universe a safer place for my family.” She doesn’t sound like she’s just trying to comfort or please the people around her. She strikes me a stronger character now, one who’s determined her own path through the battlefield. Morales still cracks jokes, mind you. In one particularly memorable moment during a training game, I heard her recoil in disgust after I killed a Warcraft opponent, saying: “Oh god, I just killed a panda!” It’s just not the same sort of sexual humor that she used to use.